Vivid, delicious and easy to make, this wild garlic velouté recipe is just the dish to make the most of one of spring's best foraged ingredients. 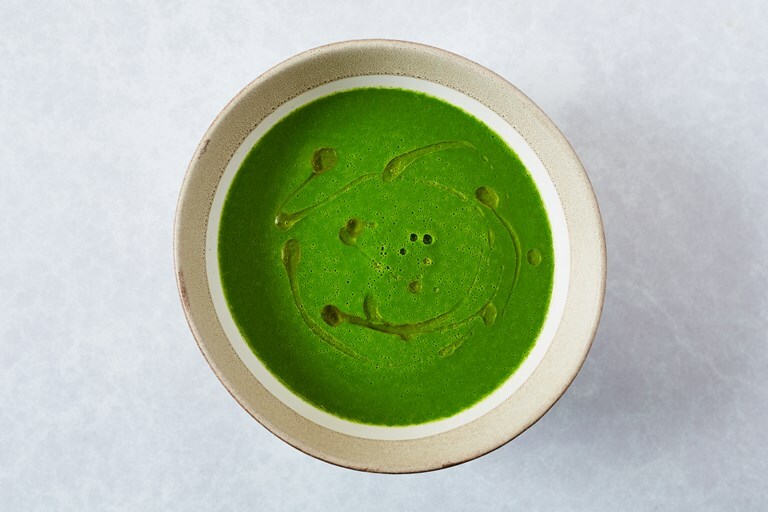 This simple wild garlic velouté is very quick to make and really showcases the vibrancy of wild garlic, both in flavour and colour. It is best eaten straight away as you’ll lose some of the colour if re-heating. This is quite a punchy soup – if you want to tone it down a bit, you can adjust the ratios of wild garlic to spinach. Feel free to use vegetable stock instead of chicken stock if you prefer, but be sure to use a good quality stock (preferably homemade) whichever flavour you choose. The word 'velouté' in this context refers to a light, fresh soup finished with cream for a velvety richness, not to be confused with the French mother sauce that is made from a roux base combined with flavoured stock.